On February 17, the Fray Bartolome de Las Casas Human Rights Center (Frayba) released a report on events that took place February 6 in the community of Bolom Ajaw, in the official municipality of Tumbala and the autonomous municipality Comandante Ramona. The report points to the manipulation of events in the media and expresses worry over the poor attitude of the government, who’s involvement dates back to 2006. The human rights center states that the root of the conflict has to do with economic interests over land because of government plans to develop the area for tourism. According to Frayba’s report “Armed attack on the Zapatista village Bolom Ajaw by PRI residents of Agua Azul,” Support Troops of the National Freedom Zapatista Army (BAEZLN) from Bolom Ajaw gathered on land that had been invaded on January 20 by residents of Agua Azul affiliated with the PRI political party and linked to the paramilitary group OPDDIC. The BAEZLN claims the land as their own, and wanted to remove the Agua Azul residents from it in a peaceful way. When they noticed the arrival of the BAEZLN, one of the PRI members shot his gun into the air, which escalated into both parties physically fighting each other. 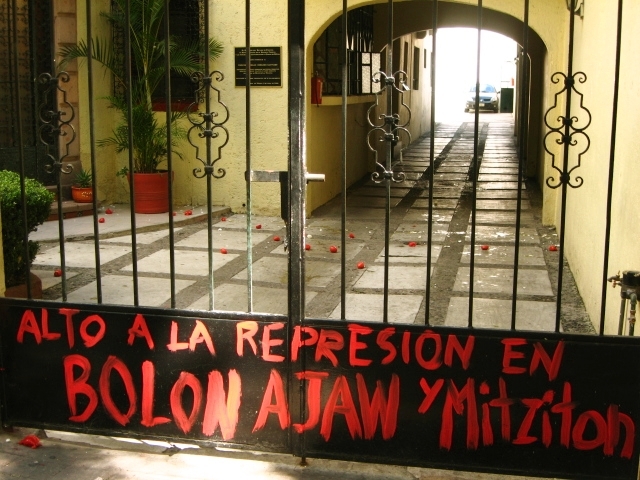 The PRI members then retreated and set up an ambush on the road toward Bolom Ajaw, which the Zapatistas broke up. The PRI members then made their way toward Bolom Ajaw. At the same time, two groups of Agua Azul residents attacked Bolom Ajaw with firearms, shooting at houses, destroying the church, and insulting the villagers. The villagers – mostly women and children – barricaded themselves inside a house finding themselves under attack by two groups from Agua Azul, as well as a group of PRI members who came from the direction of the disputed land. This entry was posted on Monday, February 22nd, 2010 at 4:18 pm and is filed under Chiapas, EZLN, Indigenous people, Justice system, Land and Territory. You can follow any responses to this entry through the RSS 2.0 feed. You can leave a response, or trackback from your own site.